I children, the condition known as hydrocephalus is more common and thus this technique is used frequently in children to deal with conditions such as hydrocephalus by making new channels to allow drainage of the cerebrospinal fluid that has built up in the brain leading to hydrocephalus. In adults, hydrocephalus can also be treated using an endoscope. In addition to this, tumours of the ventricles can be both removed and biopsied. Getting to the ventricles of the brain so that tumours and hydrocephalus has been made difficult my the poor optics and video technology previously available, and this limited surgical instruments. The principles behind the technique of passing surgical instruments into the ventricles to treat conditions are old, but the range of conditions, and the safety of these treatments had increased exponentially in recent years. Tumours within the ventricles can now be accessed, and removed via an endoscope, or with the assistance of an endoscope, thus avoiding the need for a large opening in the skull, and the need to retract (push) on the brain to allow the surgeon to see the tumour etc. This is termed ‘minimally invasive’ in surgical speak and generally allows a patient to recover more quickly from surgery. 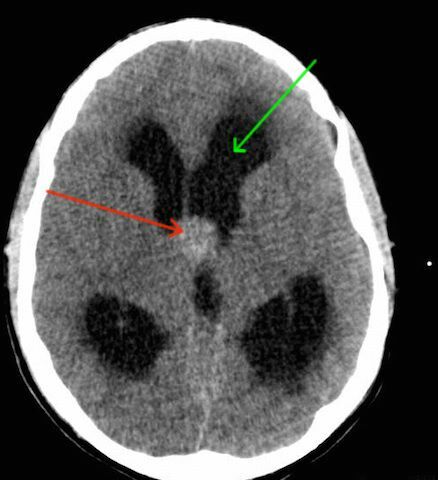 In some cases of hydrocephalus, the build up of CSF in the ventricles is due to an obstruction to the CSF draining away via the usual channel. This can be due to a condition called aqueduct stenosis, or a mass blocking the channel such as a colloid cyst or pineal tumour. These conditions may mean a ‘shunt’ can be avoided and a new channel can be made using the endoscope, or the tumour / cyst removed unblocking the flow of CSF. I also occasionally see patients with obstructive hydrocephalus treated in the past with a shunt who later develop a shunt malfunction. 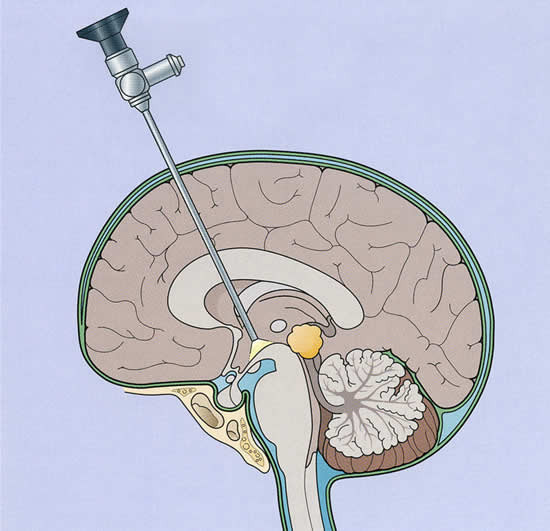 There is an option under these circumstances to treat the hydrocephalus with an endoscopic technique rather than replacing the shunt. This will depend however on the nature of the underlying cause of hydrocephalus, and the appearances of CT/ MRI scans. An endoscope is a long(18cm) thin (4-6mm) metal tube containing rods of glass which act like the lens of a camera, in addition light is shone down the endoscope. A very small HD camera is fixed to the end of the endoscope and the picture is displayed on a large HD TV screen.